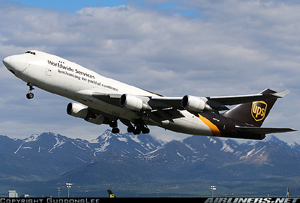 On September 3rd, 2010, UPS flight 6, a Boeing 747-44AF, departed Dubai International Airport [DXB] bound for Cologne, Germany [CGN], with a captain and first officer on board. Twenty-one minutes into the flight the crew received an indication of fire on the forward main cargo deck. They declared an emergency and requested and obtained clearance for a turn-back and descent into Dubai. Investigators determined that a rapidly progressing fire was burning in the forward main cargo deck area. Within four minutes of the first (of eight) flight deck warning, the fire had severely damaged the flight control systems, making it impossible for the flight crew to manually control the airplane. However, some control was available through the autopilot. The air conditioning system failed, causing the upper deck and flight deck area to fill with smoke, hampering the ability of the pilots to operate the aircraft. The captain's oxygen supply failed and he left his seat, in what investigators believed was an attempt to find portable oxygen, and never returned to the flight deck. Investigators determined that the captain, after leaving his seat, was overcome by smoke. Airplane control difficulties resulted in a missed the approach. Air traffic controllers attempted to reroute the flight to Sharjah International Airport, 10 miles away. The first officer, unable to control the airplane or see his instruments, could not properly navigate to Sharjah. Twenty-eight minutes and forty-one seconds after the first fire alarm, UPS Flight 6 crashed in an unpopulated area on a military base in Nad Al Sheba, Dubai, United Arab Emirates. Both pilots perished and a majority of the airplane wreckage was consumed by post-crash fire. Accident investigators determined the cause of the crash was a "catastrophic main deck cargo fire, which auto-ignited and remained in a sustained state of combustion, resulting in damage to the fire protections and critical systems, leading eventually to the loss of the aircraft and crew."